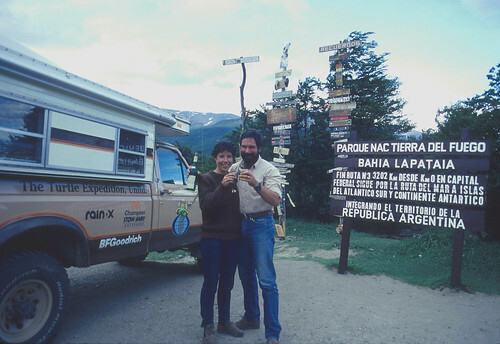 The Ford F-350, with its International Diesel engine and the Four Wheel pop-up camper, were the perfect combination for our 14-month/50,000-mile South American adventure. The Sacsayhuaman ruins in Cuzco, Peru are in the background. 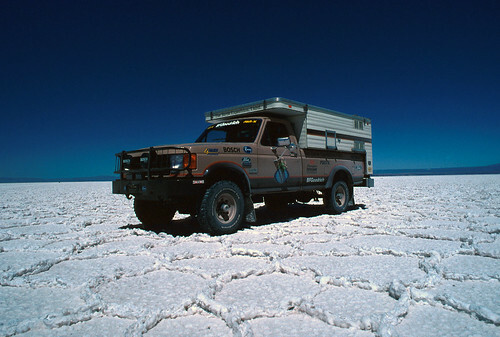 Ongoing reliability problems with The Turtle II made it a poor choice for extensive travel in Central and South America. 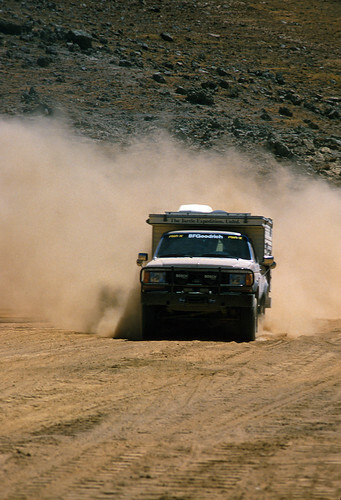 In 1987, Ford became a sponsor and supplied us with an F-350 4X4 truck, powered by the International 6.9 L diesel. The Turtle III was born. All the problems normally associated with engines—carburetors, ignition systems, fuel quality,—suddenly became a thing of the past. We added a Banks turbo and basically never touched the engine for the next 160,000 miles. 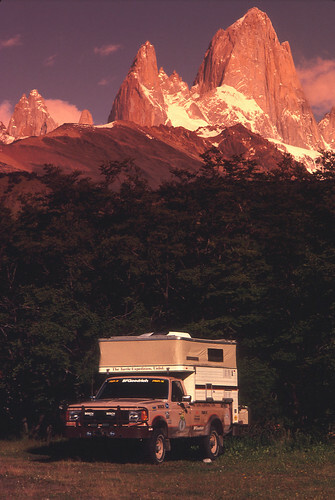 A 14-month/50,000-mile exploration of South America was proof enough. Fording rivers in Ecuador, climbing mountains in Chile (over 16,710 ft.), and slogging through the mud of the Amazon, we seldom got less than 12 to 14-mpg on whatever diesel was available. The 4-speed manual transmission was bulletproof. Later we added a Gear Vendors Under/Overdrive, giving the 4.10 gears a longer leg. 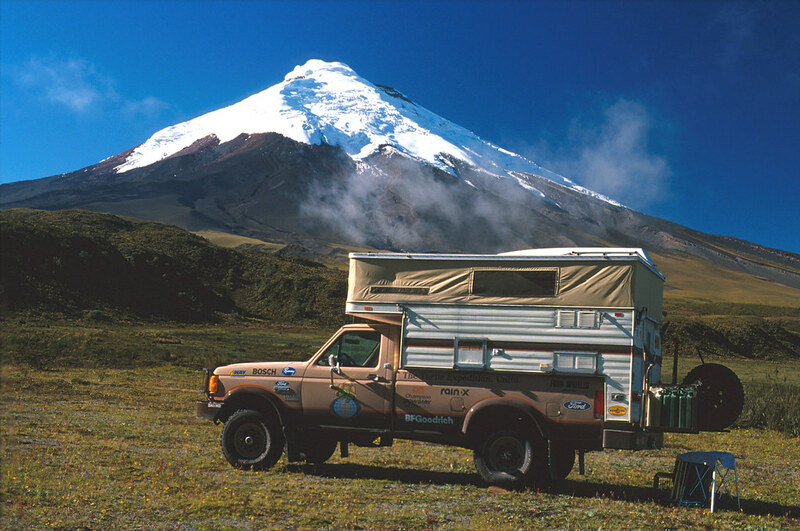 The Four Wheel Pop-Up Camper served us well throughout South America, and later in Mexico and Canada, but as any pop-up with soft sides, it was a tent, and tents, by nature, leak and are hard to keep warm. It was a good compromise for the weight and low profile, and we would later use it in Russia. 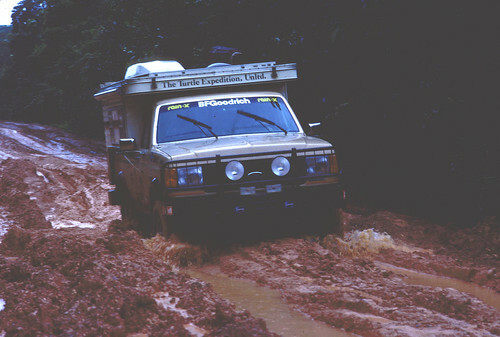 The track from Manaus to Boa Vista near the Venezuelan border was a tank trap of deep mud and washed-out bridges. We needed special military clearance to attempt this route. By now, we were starting to figure out what worked on the road. Little things like German seats, a custom walnut center console, Auto Meter mechanical gauges, BFGoodrich tires, PIAA Professional Driving Lights, and ARB Locking differentials would become standard on future Turtle Expedition trucks. In 1994, already thinking about Russia, we took International’s offer to upgrade the 6.9 L engine for the improved 7.3 L Turbo, and The Turtle III got a new lease on life. Still, driving across all of Eurasia, including a winter crossing of Siberia, would be a tough adventure for an 8-year old truck. Could it make it? Undoubtedly! Would we prefer an all new F-350? Of course! The Turtle IV was delivered in 1992. The salt flats of the Salar de Atacama were amazing. We were warned not to try this route across the Atacama Desert alone, but traveling in a vehicle like The Turtle III gave us confidence others new nothing about. Refreshed from its South American adventure, The Turtle III shows that even a fully loaded F-350 has ample wheel travel to keep all four feet on the ground. The Turtle III was designed and built to be a comfortable international backroad travel and camping vehicle. Its modification and construction were an ongoing project for nine years. Based on a 1987 Ford F-350 one-ton 4X4 pick-up, every system was built to reflect the final goal of reliability. Cost was never a factor. Our sole responsibility in choosing each piece of equipment was simply to find the best!! During all modifications, we were able to maintain the underlying basic reliability of the Ford F series truck and its international availability of parts and service. This would have proven especially important in South America if we had had any problems. We didn’t. High in the Peruvian Andes, the dusty road leading to Chiquian near Huaraz led us to the start of our 14-day backpacking trek around the Huayhuash range. The final engine in The Turtle III was a hand-assembled Navistar 7.3 Liter Turbo Diesel. It was dyno tested at the factory, fitted with an Arctic fuel injection pump allowing it to run on anything from #1 Diesel to kerosene or jet fuel, re-tested, and sent to the Navistar Marine Engine division for special paint and clear coating. After ’87 electronics were mated to the 1994 engine, it was expertly installed by Ken Imler Diesel in Sacramento. During installation, all mounts and hoses were replaced if any sign of wear could be seen. Stock diesel fuel system was modified by adding a Racor auxiliary fuel filter/water separator/fuel heater. The problematic stock Carter fuel lift pump was replaced with a more reliable Airtex pump. As previously noted, a Stanadyne Arctic Fuel Injection Pump was installed. A Transfer Flow fuel vent system was installed to allow large nozzles and high pressure hoses to be used. The Cotopaxi volcano in Ecuador is the closest point on Earth to the Sun. The equatorial bulge accounts for this fact. At something like 12,000 feet, ice crystals vaporize off the roof of our Four Wheel pop-up camper in the morning sun. Standard towing package. The heavy duty radiator was completely reconditioned and the clutch fan was replaced when the new engine was installed. Two Optima sealed batteries were kept fully charged by a Link-Arc 190 amp alternator, routed through a Link-Arc Power Tool which could supply 110 AC power and function as a full-service welder and a quick-charge battery charger. A twin solenoid battery cutoff switch sent full charge to the two GNB sealed deep-cycle batteries in the camper. The GNB batteries fed numerous 12 volt DC outlets in the truck and camper, and also produced 110 AC via a Statpower ProWatt 600 watt inverter. Both the transmission and transfer case were completely overhauled following our South American adventure, replacing all seals and bearings, and any other worn parts. A new clutch and throw-out bearing were installed. A Gear Vendors Overdrive was added. Where possible, gear boxes were equipped with remote breathers attached to K&N filters. 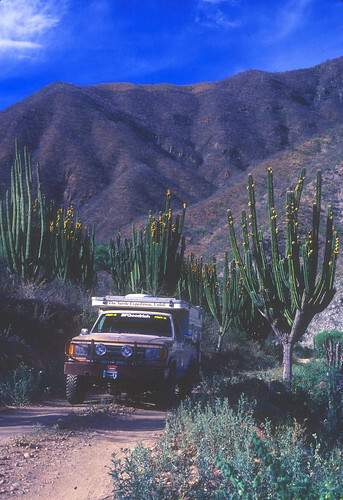 The Turtle III traveled many miles exploring the remote backroads of Baja California. 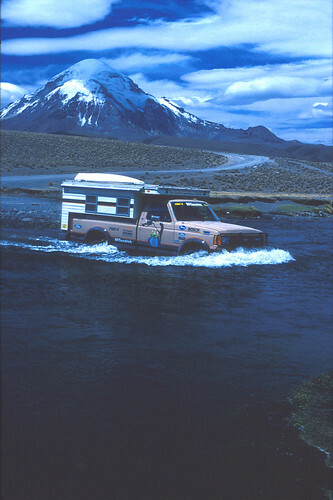 For this climate, the Four Wheel pop-up camper was ideal. Both front and rear differentials were equipped with ARB Air Locking Differential systems. Air is supplied by the Ready Air system. Differentials were connected to remote breathers attached to K&N filters. Drive lines were regularly overhauled by Central Drive Line Service in Sacramento, CA. All U-joints were Spicer lubeable types. All yolks, slip tubes and CV joints were periodically replaced with Timken, Spicer and Federal Mogul parts. Both front and rear brakes were regularly overhauled using quality Raybestos components. The entire brake system was periodically flushed with DOT 3 fluid. All axles, bearings and seals, front spindles, U-joints, and inner front axle seals were OME. Front hubs were repacked on a regular basis. Locking hubs were Mile Marker. Exploring the gold mining town of Las Claritas at Kilometer 88 in Venezuela was a challenge. 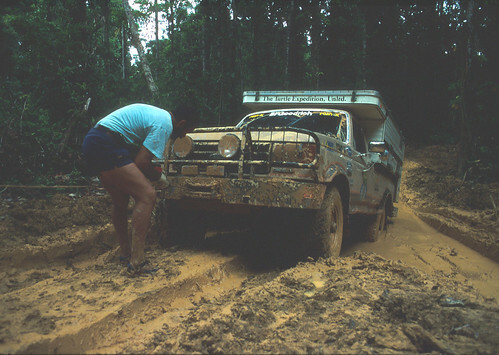 A shortcut back to the main road turned nasty enough to break out the winch. Wheels were ALCOA hot forged aluminum one-piece wheels. Tires were BFGoodrich 255/85R/16/D Mud Terrains. All spring packs were custom made and installed by National Spring in El Cajon, CA. A special duel shock set-up was designed by Ted Kendall Engineering in Lakeside, CA. Shocks were Warn Black Diamond. Stock steering. A Perma-Cool heavy duty power steering cooler was added with a removable cold-weather cover. A Warn Black Diamond steering stabilizer was fitted. The truck was equipped with a hand-stitched Grant leather steering wheel which incorporated the electronics for the Ford cruise control system and the twin Bosch air pumps which fed six very loud Bosch air horns. Our camp beneath the majestic spires of Fitz Roy in Argentina brought us one step closer to the bottom of the World. 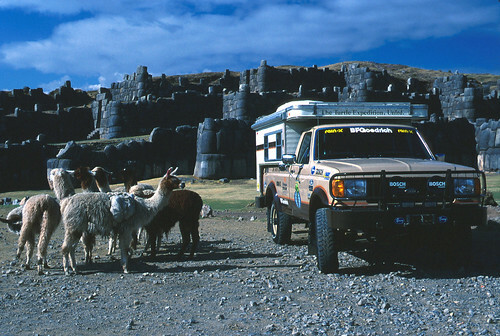 The Turtle III had performed flawlessly during this half of our 14-month/50,000-mile South American adventure. The Turtle III was fitted with custom Rickard compartment bumpers. The front unit featured two locking storage boxes and a full wrap-around bull-guard designed by Ted Kendall Engineering. It included two trailer hitch sockets, mounts for auxiliary PIAA lights, a two-speed 12,000 lb MegaWinch electric winch, and an R&M Hot Water Shower System. The rear featured a class 3 load leveling hitch, a Warn 8,000 lb electric winch, swing-away rack which held a Max Forest tool, a Hi-Lift Jack, a shovel, two German Jerri cans for fuel and water, and the spare tire and wheel. Full electrical hook-up for trailer towing wiring harness was built into the bumper. Bumpers were powder coated. German Scheel-Mann Series 400s with head rests. The passenger side was fitted with an air lumbar support. The driver’s side was fitted with a Schukra System lumbar support. Both seats were fully adjustable and of orthopedically correct design. Filler four-point racing harnesses were used. Grave robbers are rampant throughout Peru. A piece of cloth or a string of beads from an ancient Incan tomb can feed a family for a year. 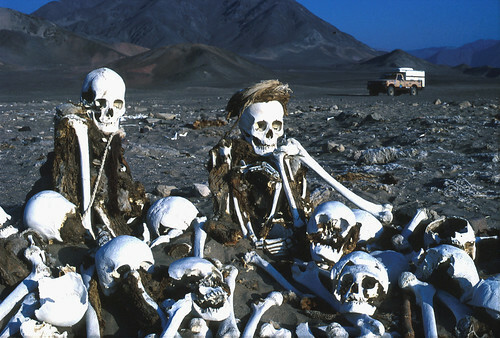 This was an eerie camp for The Turtle III in the Nazca desert. The solid walnut center console was custom made by Jean’s Cabinets to our specifications. It held a Halda Twin-Master trip meter, and was wired for an electric compass and digital inside/outside temp gauge. Two compartments held a variety of travel items. A hidden compartment was large enough for money, keys and a hand gun. The solid walnut overhead console was also custom made. It held a radar and laser detector, a full-feature Midland CB radio with PA, four Jensen auxiliary light switches, and two Osram halogen map lights. BahÌa Lapataia, the most southern place in the world you can drive to! It had been a goal of The Turtle Expedition, Unltd. for many years. The Turtle III, with its International turbo diesel, had never missed a beat. • A Ready Air system supplying 150 psi of working air pressure with air outlets at front and rear of truck. • Six Bosch air horns powered by two Bosch air pumps. • Full Auto Meter Comp Series mechanical gauges including Air Press., Oil Press., Water Temp., Volts, Boost, Exhaust Temp. Stainless braided hose was used where needed. • An Auto Meter Pro Lite oil pressure warning light is dash mounted. • An Airguide compass is dash mounted. • Two sets of mud and snow chains were included. • A five-ton hydraulic jack and blocks replaced the factory screw jack. • Twenty-five foot air hose and heavy duty air impact gun were supplied for use with the Ready Air System. • Air chuck and air nozzle were supplied. • Plasticolor heavy duty mud guards behind all four wheels. • A large selection of spare parts was included. At almost 16,000 feet on the border of Chile and Bolivia, Mt. Sajama raises its 22,000-foot snow-capped peak behind us. We regretted that we did not stop here for a week. 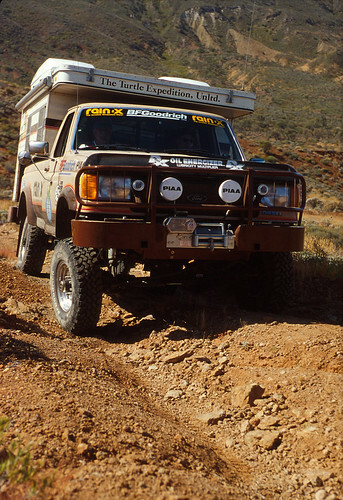 The Four Wheel Pop-Up Camper fitted to The Turtle III was built in Colorado. It was modified and repaired by the factory now in Woodland, California.